Madhuri Bhaduri has been a successful artist for the past four decades, exhibiting her works since 1986 in all major cities in India and Abroad. 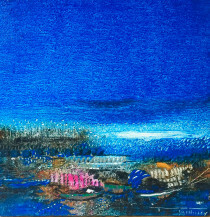 Her art works have featured in 36 solo shows and more than 70 group shows in India and abroad. She has received several prestigious awards during her art journey including the latest being felicitated by the Womenâ€™s Economic Forum (WEF 2016) as an Iconic Leader in the field of Art, Design and Entrepreneurship and the Dr. Sarojini Naidu National award for women in June 2016. 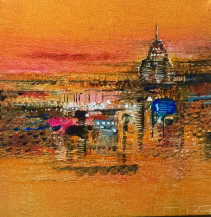 She recently received the achiever's Award in the field of Art by Savvy Magna Publications. The Artist actively participates in many National workshops and has been actively involved in contributing to many charitable organizations like Concern India foundation, Cancer patients Aid Association, Bhuj earthquake, SEC (society for the education of the crippled), CRY, Help age, etc and is constantly re-inventing herself by opening herself to different vistas, the latest being her summer study course in Finance and Art at the Sothebyâ€™s Institute of Art. 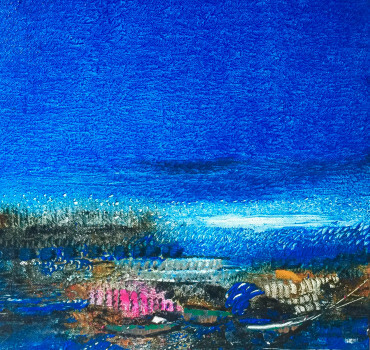 Madhuriâ€™s art works have gradually veered from the figurative to the abstractionist mode as her inner being matured so did the way she expressed her thought process and feeling on canvas. Each new series exploring the various planes of emotional experiences in a dialogue of brush and paint that is warm, vivid, sensual and completely resounding with the message of her inner spirit where there is spontaneity, hope, joy and fulfillment. In 2002 this multi dimensional artist took to sculpting and creating â€œassemblagesâ€ using metal scraps, in an endeavor to understand and realize more completely what form and shape are all about, savoring the possibilities of the expression as sculpture.